Grand Teton National Park is a United States National Park in northwestern Wyoming. 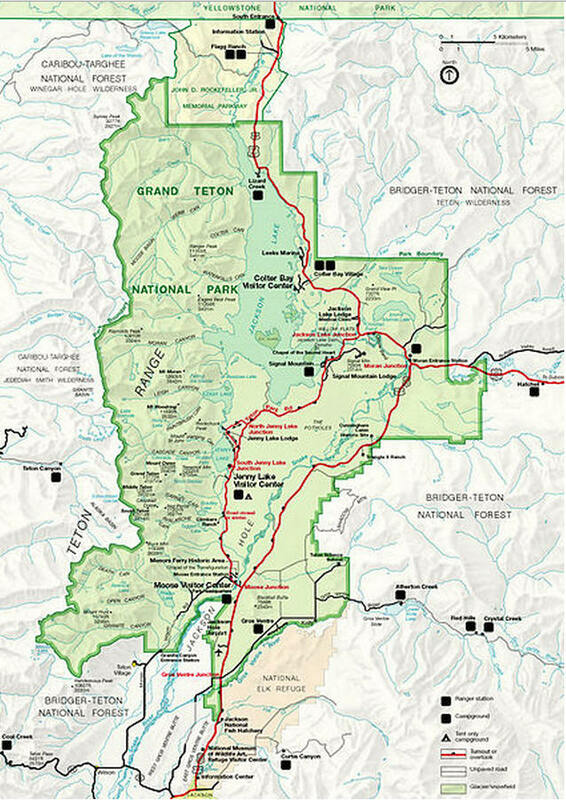 At approximately 310,000 acres(130,000 ha), the park includes the major peaks of the 40-mile-long (64 km) Teton Range as well as most of the northern sections of the valley known as Jackson Hole. 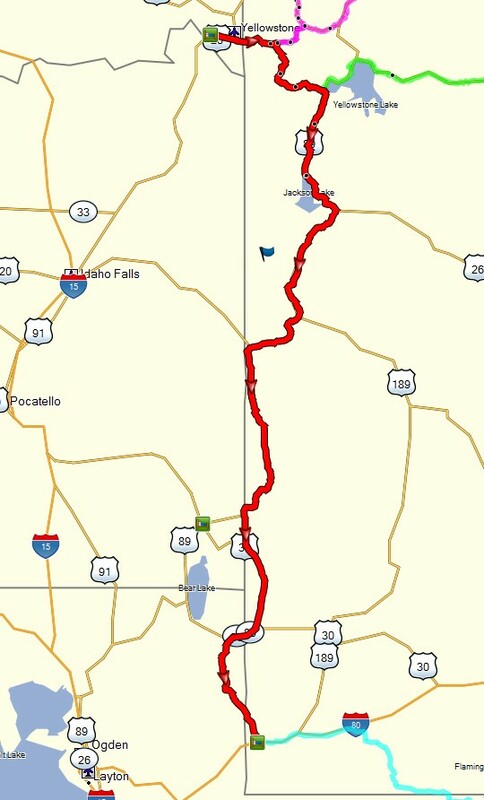 It is only 10 miles (16 km) south of Yellowstone National Park, to which it is connected by theNational Park Service-managed John D. Rockefeller, Jr. Memorial Parkway. Along with surrounding National Forests, these three protected areas constitute the almost 18,000,000-acre (7,300,000 ha) Greater Yellowstone Ecosystem, one of the largest intact mid-latitude temperate ecosystems in the world. Human history of the Grand Teton region dates back at least 11,000 years, when the first nomadic hunter-gatherer Paleo-Indiansbegan migrating into the region during warmer months pursuing food and supplies. In the early 19th century, the first Whiteexplorers encountered the eastern Shoshone natives. Between 1810 and 1840, the region attracted fur trading companies that vied for control of the lucrative beaver pelt trade. U.S. Government expeditions to the region commenced in the mid-19th century as an offshoot of exploration in Yellowstone, with the first permanent white settlers in Jackson Hole arriving in the 1880s. Efforts to preserve the region as a national park commenced in the late 19th century, and in 1929 Grand Teton National Park was established, protecting the major peaks of the Teton Range. The valley of Jackson Hole remained in private ownership until the 1930s, when conservationists led by John D. Rockefeller, Jr. began purchasing land in Jackson Hole to be added to the existing national park. Against public opinion and with repeated Congressional efforts to repeal the measures, much of Jackson Hole was set aside for protection as Jackson Hole National Monument in 1943. The monument was abolished in 1950 and most of the monument land was added to Grand Teton National Park. Grand Teton National Park is named for Grand Teton, the tallest mountain in the Teton Range. The naming of the mountains is attributed to early 19th-century French-speaking trappers—les trois tétons (the three teats) was later anglicized and shortened toTetons. At 13,775 feet (4,199 m), Grand Teton abruptly rises more than 7,000 feet (2,100 m) above Jackson Hole, almost 850 feet (260 m) higher than Mount Owen, the second-highest summit in the range. The park has numerous lakes, including 15-mile-long (24 km) Jackson Lake as well as streams of varying length and the upper main stem of the Snake River. Though in a state of recession, a dozen small glaciers persist at the higher elevations near the highest peaks in the range. Some of the rocks in the park are the oldest found in any U.S. National Park and have been dated at nearly 2.7 billion years. Grand Teton National Park is an almost pristine ecosystem and the same species of flora and fauna that have existed since prehistoric times can still be found there. More than 1,000 species of vascular plants, dozens of species of mammals, 300 species of birds, more than a dozen fish species and a few species of reptiles and amphibians exist. Due to various changes in the ecosystem, some of them human-induced, efforts have been made to provide enhanced protection to some species of native fish and the increasingly threatened whitebark pine. 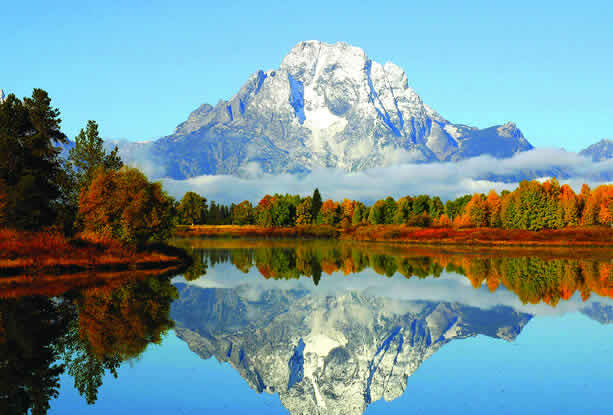 Grand Teton National Park is a popular destination for mountaineering, hiking, fishing and other forms of recreation. There are more than 1,000 drive-in campsites and over 200 miles (320 km) of hiking trails that provide access to backcountry camping areas. Noted for world-renowned trout fishing, the park is one of the few places to catch Snake River fine-spotted cutthroat trout. Grand Teton has several National Park Service-run visitor centers, and privately operated concessions for motels, lodges, gas stations and marinas. The Million Dollar Cowboy Bar has a long and colorful history that began in the late 1890's when the first commercial buildings came to Jackson. The site was the location for a Doctors office before being rented to the first bank in Jackson Hole. After the bank was torn down, Joe Ruby erected Ruby's Cafe and Beer Garden. In 1937, Mr. Ben Goe purchased the bar and changed the name to the Cowboy Bar. It was Ben Goe's good fortune that won the bar the first liquor license in the State of Wyoming following the repeal of prohibition. The bar was remodeled to include the knobbled pine which graces the bar to this day. Mr. Goe spent one whole winter cleaning and scraping the pine before it was used for construction. Since the knobbled pine was so well liked by the customers, Ben spent another 14 months transporting more of the wood, for chairs, pillars, walls and ceiling trim. At this time they also built a long fancy bar with silver dollars inlaid in the top. In the mid-1940's, the Cowboy Bar was sold to Preston Parkinson, who is responsible for the present "Million Dollar Cowboy Bar" name. Mr. Parkinson expanded the bar, again using knobbled pine to create distinctive handles, railings and other interior and exterior decorations. In 1953, a gas explosion from the basement caused extensive damage to the bar. Many of the huge pine pillars crumbled, chairs were broken, and nearly all the elaborately decorated basement was destroyed. Mr. Parkinson, a casualty of the explosion, vowed from his hospital bed that he would restore the bar to its original condition. He also added the huge neon sign that still marks the front of the bar on the town square. 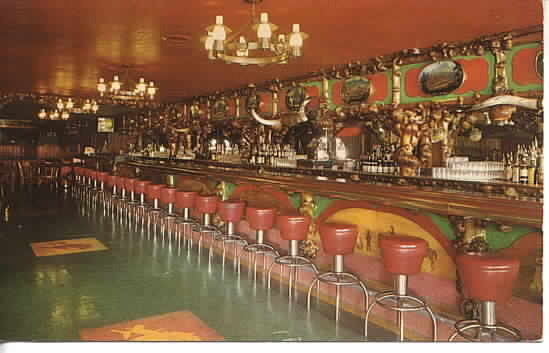 In 1973 to Ron Schultz, Bud Jensen, and Cliff Poindexter bought the bar and installed the saddle bar stools and a London-made red carpet that bore the symbol and name of the Cowboy Bar. Since 1988 The Million Dollar Cowboy Bar has been owned by Art & Carol Andersen and Hagan & the late Roger Dudley. 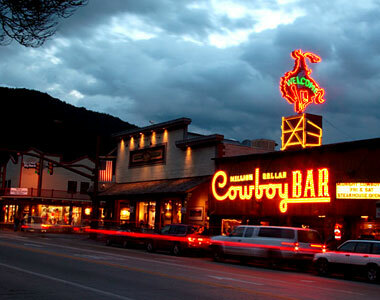 At the present time, there are no other changes expected in the structure of the bar, because The Million Dollar Cowboy Bar has the best live western music in the Tetons and it remains the number one bar in Jackson Hole. It is a vital part of western Americana, and, is renowned throughout the world as an example of what the wild Wyoming west was, and still is. Million Dollar Cowboy Bar present-day co-owner, Art Andersen, is a knowledgeable and avid collector of western memorabilia. Much of his personal collection now adorns the bar and many items are museum worthy western relics. Stop by the bar for a closer look at these and many more always-on-display artifacts. The Million Dollar Cowboy Bar has even more to offer than it's one-of-a-kind architecture, western flare and artifacts, great music and dancing. Whether it be swing dancing to country music, or shooting pool, there's always plenty to do at the Million Dollar Cowboy Bar. Just looking around at the beautiful decor of knobbled pine, animal mounts, and painting's is an event in and of itself. The Million Dollar Cowboy Bar is famous for its six nights a week swing dancing to live country music. 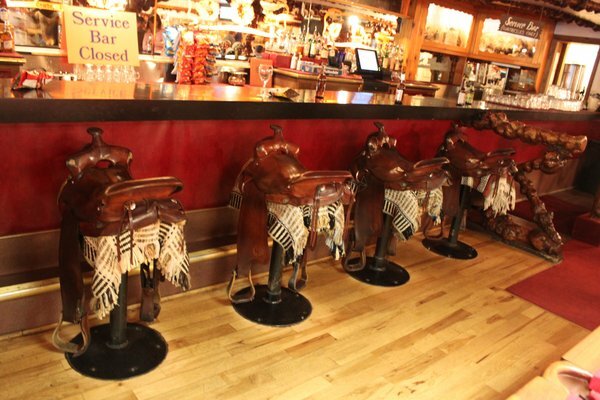 If you would rather sit and visit you can do see in the real western saddles that serve as bar stools. These saddle-stools have become a signature of the bar today. The animal mounts are one of the most-looked-at wildlife in the area. Come in and see a life size timber wolf in pursuit of a bighorn sheep. Stand face to face with a snarling grizzly bear, or look into the eye of a mountain lion. There are numerous wildlife mounts and they all add to the fun and flare of the Million Dollar Cowboy Bar. Action is always available on one of the four pool tables located in the front part of the bar. Evenings usually get the most action, so if a more relaxed game would suite your taste, stop in during the day. The Million Dollar Cowboy Bar opens at 11:00 am. Whether you prefer beer, wine, cocktails, or if you just want to visit with a soft drink the Million Dollar Cowboy Bar has plenty to offer. If you'd rather just sit back, relax and enjoy the scene, there are plenty of unique wooden tables to sit at. If the mood suits you, hop on one of the real saddle bar stools. Have a drink, grab a bite to eat and appreciate all there is to see and hear around you. The Million Dollar Cowboy Bar has even more to offer than it's one-of-a-kind architecture, western flare and artifacts, great music and dancing. The Million Dollar Cowboy Bar Beer, a golden ale, is brewed and bottled by Grand Teton Brewing Company. This ale is brewed with the finest ingredients and pure Teton spring water. Available individually, or in a unique and decorative wooden case. The Million Dollar Cowboy Bar Wines come form the Buena Vista Winery, in Sonoma, California. This winery was founded by Hungarian wine pioneer Count Agoston Haraszthy in 1857. Buena Vista Winery is California's first premium winery, and Andre Tschelistcheff, the "Dean of California Winemaking" consulted at the winery for nearly four decades, his work continues to influence the wine style today. Harvested from premium vineyards throughout the winegrowing regions of California, this Chardonnay is smooth and well structured, exhibiting wonderful richness and balance. Toasty oak, vanilla and caramel flavors combine with soft creamy pear and light honey to give this wine a rich full mouth feel leading to a crisp citrus finish. An impressive example of our Carneros Estate fruit, this Merlot is well balanced, full-bodied and packed with flavors of pomegranate and chocolate. The wine has many layers that unfold with each sip. Its round, smooth tannins lend promise to great aging potential. Philly's Phinest Grill is located inside the bar for patrons looking for a bite to eat with their cocktails or beer. Million Dollar Cowboy Bar Steakhouse, located downstairs from the bar, offers a great menu and enjoys an excellent reputation with locals and visitors alike. Call (307) 733-4790 for reservations, or visit their website at www.cowboysteakhouse.net. Cowboy Bar Gift Shop, located at the front of the bar, maintains a large selection of souvenirs and gifts relating to all things Cowboy. We carry T-shirts, ball caps, playing cards, glasses of all kinds, Coffee Mugs with History on Back, and much, much more. Our most popular items are also available online at www.cowboybargifts.com. Sturgis Pit Stop, ------sturgis link here------------ The Cowboy Bar has become a famous pit stop for all those bikers traveling through Jackson Hole to get to Sturgis, South Dakota for the annual bike rally. 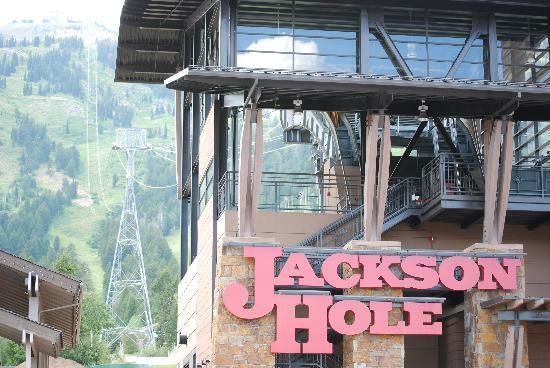 The Jackson Hole Aerial Tram will operate continuously during the summer depending upon weather conditions. There are no reservations (and no reservations needed), and the Tram will load on a first-come first-serve basis. Sudden changes in weather are common in the mountains; jackets and sweaters are advised. If you're planning to hike, please carry water, wear sturdy shoes and dress appropriately. The tram is subject to close due to wind and lightening. This is what flying feels like. 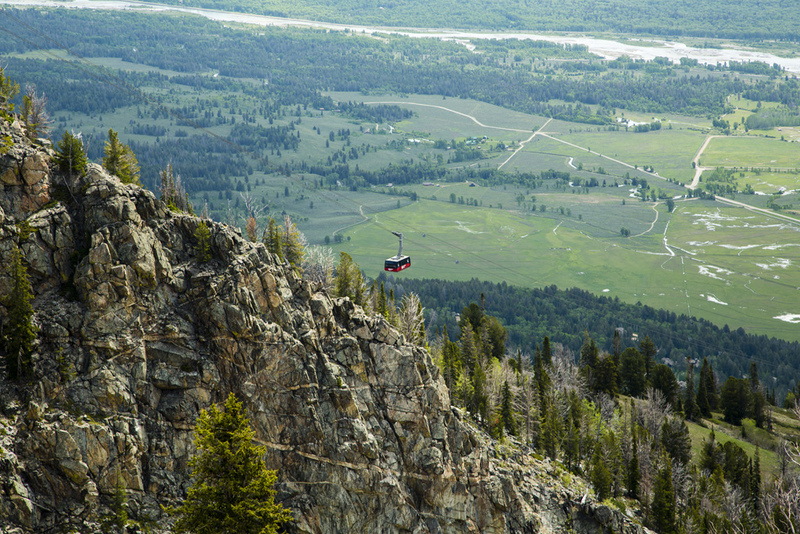 In 15 minutes, the Aerial Tram glides 4,139 vertical feet from the base of Teton Village to the top of Rendezvous Mountain. The summit offers a staggering 360-degree view of the Snake River Valley, Grand Teton National Park and the Gros Ventre Range in the distance. Even the summit of the Grand feels close from this high up. Hiking trails lace the summit, offering access to the wilderness that lies just beyond the resort’s boundaries – a world populated by wildflowers, pine trees and high-alpine lakes. On the summit, stumble upon geology; many people find fossils from the ancient oceans that once covered Jackson Hole. And there’s no need to race down: Corbet’s Cabin stocks an assortment of beverages, snacks and gear, including its famous Top of the World Waffles, fresh waffles topped with brown sugar butter, Nutella or strawberry preserves. Adrenaline junkies can take a different route down: by paraglide. Tandem paragliding flights launch from the Tram summit, boasting the largest vertical drop in the U.S.
To view tram schedule and pricing please click here. Hike around the summit to witness incredible views and take in the high alpine tundra that abounds with hardy wildflowers and fascinating geological aspects including fossils from the ancient oceans that once covered Jackson Hole! Click here for more information. Satisfy your cravings and indulge in Top of the World Waffles at Corbet's Cabin at the top of Rendezvous Mountain. These freshly made waffles are served with a choice of brown sugar butter, Nutella or strawberry preserves and provide the perfect start (or end!) to an adventurous day! Corbet's Cabin also offers an assortment of beverages, grab-n-go items and other Jackson Hole logo gear. The phone’s keypad glows in the dark as I dial the number for the Jackson Hole Mountain Resort’s morning snow report. “Six inches of new snow in the past twenty-four hours,” says the recording. Outside the window, fresh pillows of snow crown fence posts and shrubs. Waves of flakes halo the streetlights. The sky wears the slightest tinge of blue. The report, taken from an automatic gauge high on Rendezvous Mountain, has been stingy all season. Instead of six inches, there could be eight. Or ten. Sleeping any longer is out of the question. On the road to Teton Village, I pass a herd of horses moving across a pasture in the predawn gloom. They plod in single file, their backs dusted white. At 7:15 AM, one hour and forty-five minutes before the resort opens, the tram maze at the village already sprouts a thicket of skis and poles. The protocol: If you arrive early – by seven – you can leave your skis in line while you buy a breakfast burrito or warm up in Nick Wilson’s restaurant. Don’t return to your spot much later than eight, however, or you might find your skis tossed over the rail into the snow thirty feet below. But if you’re unwilling to stake out a place in line, you’re missing the point. Arriving early enough for the “first box” is as much about the buzz as it is about the snow. First box doesn’t necessarily mean first tracks. After all, the ski area opens to the public only after several tram-loads of patrollers, guides, instructors, clients, photographers, models, and a few smooth talkers have already unloaded atop the mountain. But it does mean fresh tracks, as well as a fresh chance to bond with others in line who share your disease. Call it Rendezvous fever. It’s marked by insomnia (many in the tram line woke before their alarm clocks rang), numbness (the body’s natural defense when standing in the frigid tram dock for two or more hours) and restlessness (only on a powder day does 9 AM seem like a long time in coming). The ringleader grins and shrugs. He woke his companions up at 6:00 this morning to be at the tram at 6:30. “I fell in love with this place the first time I came, in 1973,” he says. On that trip, it snowed three feet one morning; he was one of only eight skiers on first box. Times have changed. It’s 8:15, and the maze at the tram dock is completely full. Outside the maze, all the neophytes who thought they’d get first box by arriving forty-five minutes early mill about helplessly, like sheep on the wrong side of the fence, cut off from the rest of the flock. Inside the maze, rumors abound of snowfall twice as deep as what was reported. Previous powder days are relived. Plans for the day’s first run are mulled over. You can bet everybody knows exactly where they will head once they’ve unloaded at the top. But don’t bet on them telling you. Everybody groans. But when the tram stops, the doors fly open. A cold wind leaps into the car, and the tram dock rumbles under 108 heavy boots. Despite the patrol’s protests, the eager occupants of the first box have been unleashed onto the mountain. They clatter down the metal stairs, throw skis and snowboards onto the snow, and shove boots into bindings. A minute later, the mountain’s summit is silent again, save for the whirring of the tram’s haul cable as the car heads back down. From below, in Rendezvous Bowl, come the whoops and howls of paradise found. After a 2005 study revealed that the nearly 40-year-old tram would need major maintenance and upgrades, the Kemmerer family pledged (in August 2006) to fund the $25 million required to build a new one. Designs for the new 100-person tram were released and approved in early 2007. Demolition and construction began in April, 2007, the day after the mountain closed for the summer season. Swiss company Doppelmayr CTEC built the new steel tram towers, terminals and mechanics in Switzerland. In March 2008, the company will shipped all these components via 50 sea containers to Houston, Texas, where they arrived via rail and road to Jackson Hole, WY. Construction was completed on time for the December 2008 launch. After its launch in December 2008, Big Red is twice the size of the old tram and 20% faster, bringing skiers and snowboarders from Teton Village to the summit of Rendezvous Mountain in a mere 9 minutes. Situated in the heart of the Tetons and leveraging the ‘mechanical advantage’ of North America’s most iconic lift, Jackson Hole offers an unparalleled big mountain skiing experience. Length: 12,600 ft / 3,840 m (Slope); 11,895 ft / 3,626 m (Horizontal) 12,463 ft.
Lower Terminal Elevation: 6,311 ft. 6,311 ft.
Upper Terminal Elevation: 10,450 ft. 10,450 ft.